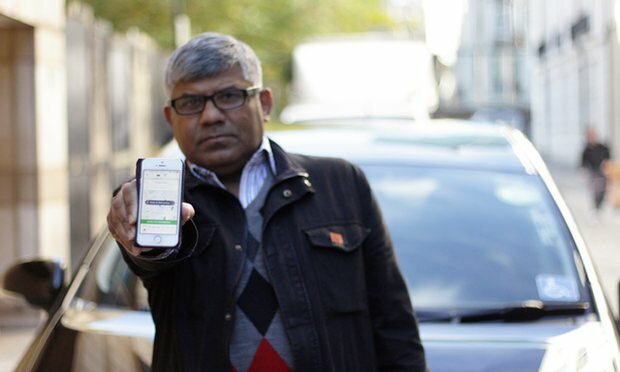 Two Uber taxi drivers have won a legal case in the London Central Employment Tribunal. The court decided that the drivers should be classified as workers rather than self-employed and therefore should be entitled to things like the National Living Wage, paid holiday and paid rest breaks. This is potentially a big decision for workers in the ‘gig economy’ but it will by no means be the end of the story. Uber immediately said it will appeal the decision, and the decision of an Employment Tribunal is technically not binding on other tribunals, although clearly they will look at it. 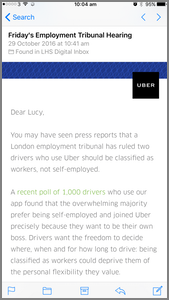 You may have seen press reports that a London employment tribunal has ruled two drivers who use Uber should be classified as workers, not self-employed. A recent poll of 1,000 drivers who use our app found that the overwhelming majority prefer being self-employed and joined Uber precisely because they want to be their own boss. Drivers want the freedom to decide where, when and for how long to drive: being classified as workers could deprive them of the personal flexibility they value. Last month drivers who used our app in the UK made on average over £16 per hour in fares, after our service fee. Even after deducting costs, this is well above the national living wage. We’re proud that Uber has created flexible opportunities for thousands of people to make money when and where they want. It’s why we are appealing this decision. As a result of this highly controversial case dubbed “the case of the year in employment law” there have been a number of moves to assess the working conditions of the “on-demand” or “gig-economy”. The government has already set up an independent review of modern working practices which will look at things like the ‘gig economy’, a Parliamentary Committee has also launched an inquiry to look into UK working conditions amid exploitation fears, and the UK’s largest union, Unite, announced that its setting up a new unit to support its members and pursue bogus self-employment across all sectors. It’s clear that the position of Unite is at extreme odds with that of Uber whose recent driver survey paints a completely different picture, maintaining that 9 in 10 drivers are satisfied driving with Uber. We will be reviewing the decision of the court over the coming days and putting together more detail for you on the impact of the case and the government response but, in the meantime, if you may be affected by this decision, please do call us on 0333 444 0165 for specific advice.